Clockwise from Top Left: A creepy smile on the steps outside the new museum buildings at the far end of Tjuvholmen, designed by Renzo Piano, which now house the Astrup Fearnley Modern Art exhibition ; Oslo's Beaver Statue, unnamed, sits outside a print shop on Dronning Mauds gate. A tad random, yes. 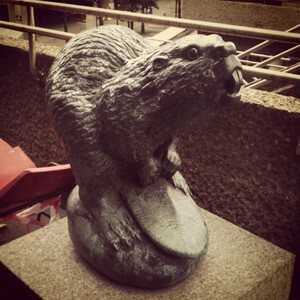 And do beavers actually sit on their tails like that? 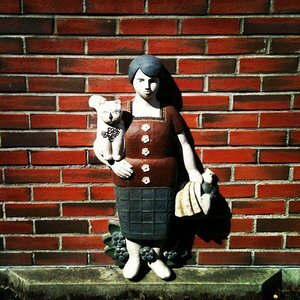 ; The Cat Lady is one of four figures decorating an otherwise standard fountain fixture outside an office building in Lysaker; The Tiger paces outside Oslo Central Station and greets new visitors! The Tiger is definitely my favorite of these four. He was a gift to the city on its 1000-year anniversary in the year 2000. 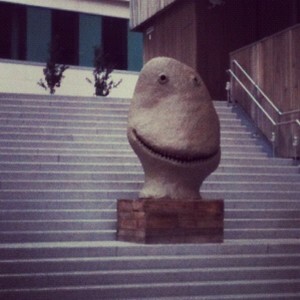 According to VisitOslo.com , he is probably the city's most-photographed inhabitant. In his poem "Sidste Sang" from 1870, Norwegian poet Bjørnstjerne Bjørnson describes a fight between a horse and a tiger. The tiger represents the dangerous city, and the horse is the safe countryside. 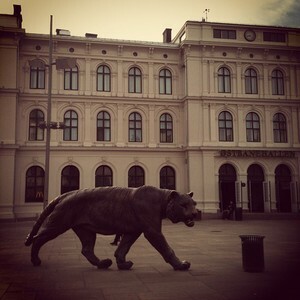 Since then, Oslo has sometimes been called Tigerstaden, or The Tiger City. Parts of the Tiger have been rubbed shiny by tourists... the tail, nose, ears, and, of course, testicles. Because sophistication takes a hike when faced with a 4.5-meter long bronze tiger. Last year I blogged a bit about the statue of WWII Norwegian resistance leader Gunnar Fridtjof Thurmann Sønsteby at Solli plass. What's your favorite statue in Oslo?